We have another heavy gale of wind, and it is not easy to sit fast, or to hold a pen; but, as the distance between us is lessening at the rate of seven or eight miles per hour, I am willing to fill up my paper as fast as I can. I wish I had words to convey some idea of the scene around me: but it cannot be fully described. A faint conception may be formed from pictures, or prints, of a storm at sea. Imagine to yourself an immense body of water behind you, higher than a house, and a chasm of equal depth just before you: both so apparently dangerous; that you could hardly determine which to venture; and both so near, as not to allow you a moment’s time to choose; for in the twinkling of an eye the ship descends into the pit which is gaping to receive her, and with equal swiftness ascends to the top on the other side, before the mountain that is behind can overtake her. And this is repeated as often as you can deliberately count to four. It is indeed wonderful, that a ship will run incessantly over these hills and dales, for days and weeks together, (if the gale lasts so long,) without receiving the least damage, or taking any considerable quantity of water on board; and yet never be more than four or five yards from a sea, which, if it was quite to reach her, would perhaps disable her beyond recovery, if not beat her to pieces at a single blow. Need we go farther for the proof of a Providence always near, always kind, kind to the unthankful and the evil? For, though these marks of his care are repeated every minute, they are seldom acknowledged by seamen. For my own part, I see dangers so numerous and imminent, that I should be always in anxiety and fear, could I not submit myself and all my concerns to Him who holds the waves of the sea in the hollow of his hand, as the prophet strongly expresses it; so that, when most enraged by the winds, I am sure they dare not rise a single inch beyond his permission. In the course of writing a book on John Newton (1725–1807), I read all of his 1,000 published letters at least twice. He was a brilliant pastor, and in his pastoral letters I often discovered lines too good, too funny, too challenging, too humbling, or too Christ-centered not to be shared on Twitter instantly. While I should probably explain my process more in the future, I can say Twitter mostly serves as a platform where I drop research fragments to be later collected for future projects. Today I trolled my Twitter archive and collected my Newton tweets from the past two years of research and organized them into an alphabetical list of quotes to give you a taste of what you’ll find in my book and what you’ll read in Newton’s letters (like those in this wonderful collection). Today Newtcation ends. It’s been a wonderful several days spent mostly off-line and with a lot of time with the family at the local pool and lakes, and bowling, and attending little league softball and baseball games. I’m now emerging out of the 18th century and find myself playing catch-up on DOMA, Tsarnaev, Randy Travis, Metta World Peace, Trayvon, Chris Weidman, Sharknadoes, plane crashes in Alaska and SFO, unrest in Egypt, and wildfires in Arizona. So much has happened in the last two weeks. Going off-line has been worth it. 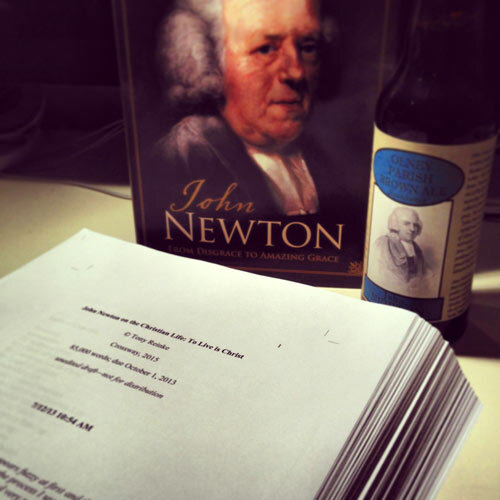 Yesterday I finished the first draft of the Newton book, which I began writing 9 months, 25 days ago. Over these past two weeks I’ve had time to write the final 20% of the book. At 87,606 words, the draft is far too long and will need to be trimmed in the next phase of re-writing (and re-re-writing) that begins now. 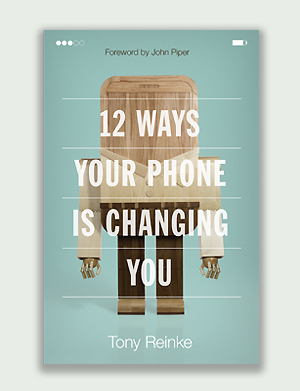 In the coming months I will be trimming content, tightening sentences, and sharpening the language of the book. From my experience, this is the most enjoyable stage in the writing process. The manuscript, in its present form, has been passed along to Pastor John, who has kindly offered to read it (gulp) and pen the foreword. Piper’s enthusiasm over the years for Newton, and his popular biographical sketch, have all become significant factors in the enduring legacy of Newton and his works in the Church today. Irrespective of whether my book is any good, to have a foreword from him is not only an honor, but will also provide a push behind Newton’s legacy to extend its life for at least one more generation. Alas, a lot of great memories will stay with me from Newtcation, but I look forward to getting back to work tomorrow. Thank you to everyone who prayed for me over these past two weeks as I completed research and writing the first draft of Newton on the Christian Life. I was sustained by God’s amazing grace all along. I sometimes think that the prayers of believers afford a stronger proof of a depraved nature than even the profaneness of those who know not the Lord. How strange is it, that when I have the fullest convictions that prayer is not only my duty — not only necessary as the appointed means of receiving these supplies, without which I can do nothing, but likewise the greatest honor and privilege to which I can be admitted in the present life — I should still find myself so unwilling to engage in it. However, I think it is not prayer itself that I am weary of, but such prayers as mine. How can it be accounted prayer, when the heart is so little affected — when it is polluted with such a mixture of vile and vain imaginations — when I hardly know what I say myself — but I feel my mind collected one minute, the next, my thoughts are gone to the ends of the earth. If what I express with my lips were written down, and the thoughts which at the same time are passing through my heart were likewise written between the lines, the whole taken together would be such an absurd and incoherent jumble — such a medley of inconsistency, that it might pass for the ravings of a lunatic. When he points out to me the wildness of this jargon, and asks, is this a prayer fit to be presented to the holy heart-searching God? I am at a loss what to answer, till it is given to me to recollect that I am not under the law, but under grace — that my hope is to be placed, not in my own prayers, but in the righteousness and intercession of Jesus. The poorer and viler I am in myself, so much the more is the power and riches of his grace magnified in my behalf. Therefore I must, and, the Lord being my helper, I will pray on, and admire his condescension and love, that he can and does take notice of such a creature — for the event shows, that those prayers which are even displeasing to myself, partial as I am in my own case, are acceptable to him, how else should they be answered? And that I am still permitted to come to a throne of grace — still supported in my walk and in my work, and that mine enemies have not yet prevailed against me, and triumphed over me, affords a full proof that the Lord has heard and has accepted my poor prayers — yea, it is possible, that those very prayers of ours of which we are most ashamed, are the most pleasing to the Lord, and for that reason, because we are ashamed of them. When we are favored with what we call enlargement, we come away tolerably satisfied with ourselves, and think we have done well. I thought I’d drop a personal update as a means of soliciting your prayers. For the next few weeks I’ll be taking some time off from work to devote focused attention on my John Newton book, and to enjoy a staycation with the family. My wife is calling it Newt-cation. The family schedule has been cleared, and I hope to write in the mornings and early afternoons, and then laugh and veg and swim and tan with the fam the rest of the day. These precious weeks will give time to really narrow my writing focus. I started the Newton book on September 16 of last year, and by researching and writing on Saturdays alone (as time allowed), I’ve managed to rough out 10 of the 14 chapters and to pen about 75% of the total 85,000 words. These next two weeks will give me the time necessary to finish up these four last chapters and to invest substantial time in refined research on a few areas of particular interests in Newton’s letters. 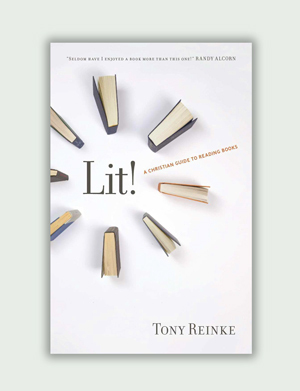 And unless the editors read my book, cringe, and change their minds, it’s scheduled to be published in the summer of 2015 in Crossway’s Theologians on the Christian Life series. There’s nobody I would rather write on (Newton), nobody I would rather write for (Crossway), and nobody I would rather write under (editors Justin Taylor and Steve Nichols). The great delight in working on a project like this one is the opportunity to get intimately acquainted with a great Christian thinker from the past, especially when it comes to studying how they processed the intricate dynamics of the Christian life. 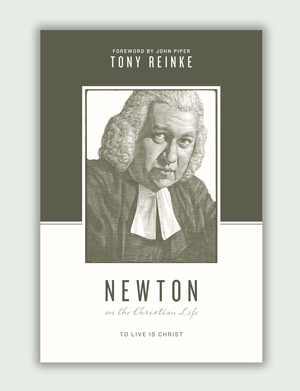 Having been discipled by Newton for years now, and more rigorously for the past year, I find myself more and more thinking like him and applying the gospel to my everyday life in ways he models from his own life. I find it easy to get excited about Newton and I am eager to share the results of my research with you as soon as possible. 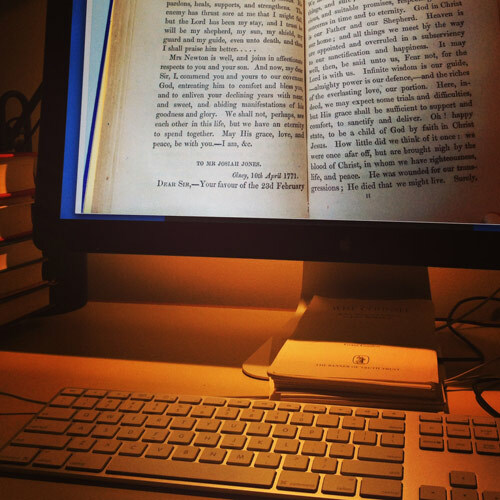 But for now I need patience, and discipline to write clearly, and so I would greatly appreciate your prayers as I try and wrap up the majority of the Newton manuscript in July. And so (as Newton would say it), I earnestly entreat all who know how to draw near to the Throne of Grace by Jesus Christ, to strive mightily in prayer for me, that I may stand fast in the faith, and increase in the knowledge of Jesus the Savior; and that for his sake I may labor, without fear, in the service to which he has been pleased to call me. May the grace of our Lord Jesus Christ be with you all! A most valued friend of mine, a Clergyman now living, had for many years given a rational assent to the Gospel. He labored with much earnestness upon your plan; was very exemplary in his whole conduct; preached almost incessantly (two or three times every day in the week for years), having a parish in the remote parts of Yorkshire, of great extent, and containing five or six different hamlets at some distance from each other. He succeeded likewise with his people so far as to break them off from outward irregularities; and was mentioned, in a letter to the Society for propagating the Gospel (which I have seen in print) as the most perfect example of a parish priest which this nation, or perhaps this age, has produced. Thus he went on for many years, teaching his people what he knew, for he could teach them no more. He lived in such retirement and recess, that he was unacquainted with the persons and principles of any who are now branded as enthusiasts and methodists. One day, reading Ephesians 3 in his Greek Testament, his thoughts were stopped by the word ανεξιχνιαστον [unsearchable], in verse 8. He was struck, and led to think with himself to this purpose: The Apostle, when speaking of the love and riches of Christ, uses remarkable expressions; he speaks of heights, and depths, and lengths, and breadths, and unsearchables, where I seem to find every thing plain, easy, and rational. He finds mysteries where I can perceive none. Surely, though I use the words Gospel, faith, and grace, with him, my ideas of them must be different from his. This led him to a close examination of all his Epistles, and, by the blessing of God, brought on a total change in his views and preaching. He no longer set his people to keep a law of faith; to trust in their sincerity and endeavors, upon some general hope that Christ would help them out where they came short; but he preached Christ himself, as the end of the Law for righteousness to every one that believeth.